Two Bears Farm and the Three Cubs: Muffin Tin Monday - Valentine's! Muffin Tin Monday - Valentine's! Today is Muffin Tin Monday and the theme is Valentine's. Pierce had a glass of water with a straw of hearts, some steamed broccoli in a heart muffin cup with a heart pick, a piece of homemade pizza (with a heart cut out of the pepperoni, mozzarella, goat cheese, olives, and mushrooms), applesauce in a red present muffin cup with heart frosting/sprinkles, and a happy face heart egg in a heart muffin cup. He ate everything but the pizza. Well, he ate the toppings off the pizza. Strange day - he usually adores pizza. You just never know what they're going to eat on any given day! I love you meal! We are going to have pizza tonight. I love how you reused the present cup too. I agree w/ JDaniel.. 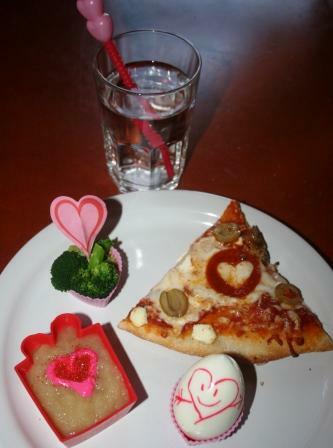 I love the meal :) The heart shaped pepperoni is really cute too! Yeah I love how one day they love something, the next they hate it and then they love it again!! That so sweet! I never thought about cutting out hearts in the pepperoni! I have some of the large pepperoni that would make it easier to cut too! Too funny about the pizza! That would have been my first bite. Love how you did the pepperoni. What a sweet little meal! I remember my daughter had interesting tastes at your son's age-and what she liked and would eat literally did change from day to day. I'm so thankful now-that at 15, she has excellent eating habits. That is so creative! I love it, great job. Happy Valentine's Day! Wow, that is the very best Valentine's meal I have seen. You sure have some good ideas. Also I was looking at your crockpot recipe for brocolli etc. That sure looks good. Thanks for coming by our blog. Happy Valentine's day. Have a happy heart day!!! Talk about creative - You seem to know what Valintines Day is all about!!! Thanks for the compliments on the ram... he is definately a neat guy. This is so clever! And I love the jello stickers (how FAB) and that crock pot recipe! Thank you for your sweet comment too - funny thing, mine is a total tomboy - she still lets me dress her, but she is totally dinosaurs and trucks at heart, lol! What a perfect Valentine meal! I wonder if he knows just how awesome his mama is??? The happy face heart egg is adorable! So cute, and so creative! Yum! Love the pepperoni heart! Too cute! my girls have been only eating the toppings lately too. hmmmmm. we made homemade heart-shaped pizza too, and pink heart-shaped rice krispy bars (my grama's recipe) --- so yummy! GREAT idea to cut the heart out of the pepperoni! I'll have to do that next time. Ever think about writing a children's cook book? I like the heart happy face on the egg! What did you use to draw on it? a kind of food pen? was it on the actual peeled egg? or on the outer shell?